Physicians who blog, Twitter, or Facebook with their colleagues or patients are invited to attend one of two special sessions on communicating with patients on Friday, May 1, at TexMed 2009. Are you looking for a way to connect with other physicians or practice managers? Have you been trying to find other practices similar to yours using EMR? Do you want to discuss problems you’ve been having with payers? For the third year, the John P. McGovern Foundation in Houston has approved a $10,000 challenge grant to the Texas Medical Association Foundation (TMAF) as the basis of its Star/Superstar campaign. Find your favorite TMA blog at Alltop Health along with Google Health, Mayo Clinic, the New York Times, and WebMD. William Gimson, chief operating officer of the Centers for Disease Control and Prevention, became the first executive director of the Cancer Prevention and Research Institute of Texas (CPRIT) on March 30. TMA has joined the American Medical Association and other medical societies across the nation in expressing their views on new policies that would have a serious impact on physicians' practices. Four Texas medical school students will receive $10,000 scholarships, thanks to the 2009 Texas Medical Liability Trust (TMLT) Memorial Scholarship program. TMA will host an audio conference from noon to 1 pm, Central Time, April 16 on the Federal Trade Commission's "red flags" regulations that require physicians to develop written identity theft prevention programs. Acting on a nomination from TMA, the American Medical Association honored Gov. Rick Perry with its Dr. Nathan Davis Award for Outstanding Government Service. The two-year delay in implementing the International Classification of Diseases, 10th Revision (ICD-10) code sets has received the final approval from the Obama administration. State Medicaid officials say they are trying to help clients stop smoking by changing the program’s coverage policy and starting a pilot program to see if counseling helps. Progress on bills to improve our fight against vaccine-preventable diseases. State Workers' Compensation Commissioner Rod Bordelon fined nine insurance companies and two physicians $169,800 for violating state workers’ compensation regulations. State officials have launched a physician loan repayment program as part of their effort to enhance the Medicaid program. Applications are due by June 1. 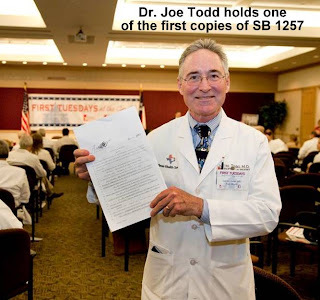 Health insurance reform is TMA's main priority in the 2009 legislative session, and the association is taking bold steps to convince lawmakers to make insurers' business practices more transparent and accountable to physicians and patients. Medicare's effort to recoup improper payments to physicians through its Recovery Audit Contractor (RAC) program "is an enormous burden on the affected physicians and has failed to further the worthy goal of eradicating frequent billing mistakes." Several coding provisions of the Blue Cross and Blue Shield settlement agreement, which provide for greater transparency in claims processing and payment practices, took effect Jan. 21. Texas has lost ground in the fight against obesity and tobacco use. That's according to America’s Health Rankings: A Call to Action for Individuals &amp; Their Communities 2008 Edition, a report by United Health Foundation, the American Public Health Association, and Partnership for Prevention. Dismal findings show the state plummeted from ranking ninth in 2007 for prevalence of smoking to 19th in 2008. And Texas slipped from 32nd for prevalence of obesity in 2007 to 39th in 2008. This installment of Podcast TMA looks deeper at the issue, as reported in the cover story of the March 2008 issue of Texas Medicine magazine. Today, Kimberly Edwards, MD, an Austin pediatrician and chair of the Texas Pediatric Society's Obesity Committee, and Jeffrey Levin, MD, chair of the Texas Medical Association's Council on Public Health and a Tyler occupational medicine physician, discuss the findings of the America's Health Rankings report and suggest ways the state can improve its overall public health performance. Changes that need to occur in how the state approaches obesity and tobacco use.